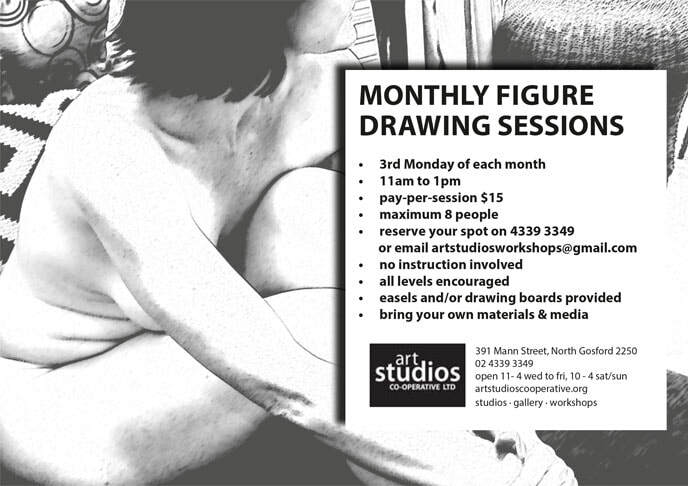 Our monthly figure drawing sessions are on the 3rd Monday of each month from 11am - 1pm. These sessions do not include instruction but we do encourage all levels of ability to attend. We provide easels, drawing boards and chairs. Please bring your own paper & drawing materials. Art Studios Co-operative is located at 391 Mann Street, North Gosford, with a workshop space and of course working art studios. There is limited off-street parking in front of the building, or street parking on Mann Street (near the car yards) or around the corner in Dwyer Street. To find the workshop, simply walk up the side driveway through the gate to find the big glass doors to the workshop room. The cost for each session is $15. Our maximum number of participants is 8, so please send an email to artstudiosworkshops@gmail.com to reserve your spot,or fill in the form below. Join the mailing list below to be notified of dates in 2018.